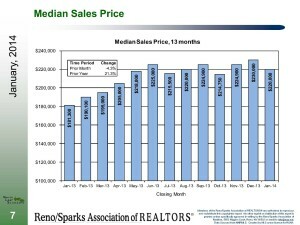 Thanks to the Reno/Sparks Association of Realtors for the update Reno/Sparks real estate stats for January 2014. You can view the whole report by clicking the picture to the right. Below is an overview of the statistics and a brief description what it all means. The median sales price fell to $220,000 in January. Down from $230,000 in December 2013 but up 21.3% from January 2013. The median sale price of regular sales was down 6.9%, REO (bank owned) down 9.8%, and short sales down 10.5%. The days of sellers getting whatever they want seem to be over as many overpriced properties are having to reduce price in order to sell. Regular sale properties average 94 days on the market, REO at 99 days, and short sales are still taking forever at 216 days. Number of units sold was down 29.8% from December 2013 and down 3.9% from January 2013. This has a lot to do with changes in lending regulations and sellers unreasonable pricing their homes. New listings were up 78.4% from December and up 22.1% from January 2013. 53% of the new listing were under $250,000. Regular sales took 77% of new listing market share. Months supply of inventory jumped up to 4.6 months. Moving it closer to a balanced market but technically still a sellers market. Overall, lending regulations, quickly adjusting rates, and overpriced homes have slowed the market as buyers don’t have the same purchase power as before. Posted in For Buyers, For Sellers, Market Update and tagged reno first time buyers agent, reno listing agent video, reno move up buyers agent, reno real estate blog information, reno stats for buyers, reno stats for sellers, zillow price reno.